Moscow schoolchildren will soon have to wear military-style dog tags and carry special "passports" as part of a security drive in the wake of Beslan. The Russian capital is also beefing up protection of its schools against intruders to prevent any terror attacks like the Beslan mass hostage-taking. "Before the New Year most schools will have these passports," a senior Moscow city official told BBC News Online. Yuri Popov said the metal dog tags were already being mass-produced. 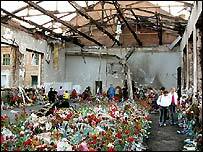 More than 330 schoolchildren, teachers and parents died when the hostage-taking in the North Ossetian town of Beslan ended in a bloodbath. Dozens of victims remain unidentified more than a month after the tragedy. Mr Popov, head of the Moscow city assembly's security and legislation committee, said children would wear the dog tags round their necks and carry the passports in their pockets, which would bear their fingerprints and other personal data. The passport will give the child's name, address, telephone number, blood group and details of any allergies to medicines, he said. It will also include advice on how to act in the event of an emergency, such as a terrorist attack. "These measures can be introduced under the city's programme for civil defence," Mr Popov said. "We asked teachers, school governors, and they conducted surveys. Most were in favour," he said. The city authorities have been working on ways to improve school security since November, he added. The city authorities want to make sure that the private security firms guarding school premises carry out proper training, Mr Popov said. Guards will not be armed - their role will be to alert police if they spot something suspicious, he said. New legislation is required "to clearly define the status of school premises - who is allowed in, who is not," he explained. Moscow has about 1,500 schools and 3,000 kindergartens. Russian lawmakers are currently reviewing all of the country's anti-terror laws, Mr Popov said. Installing alarm systems in all Moscow schools will cost about 200m rubles ($7m) and erecting security fences around the buildings will cost another 600m rubles ($20.5m), he said.